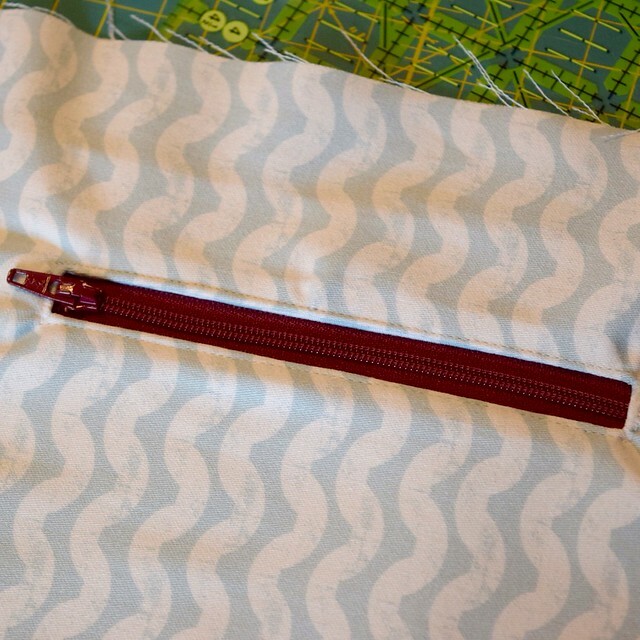 I made the Noodlehead Cargo Duffle (free pattern) along with at least half the online quilting community with the intent of it being my overnight/weekend bag to go camping or traveling with. I don’t get to make bags as often as I would like because I just don’t need that many! I carry a diaper bag with my daughter, and a backpack when I go to school, and that covers about 98% of my life. 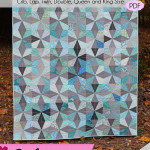 This is an amazing pattern, considering it’s free! The only tricky part is cutting out the fabric. 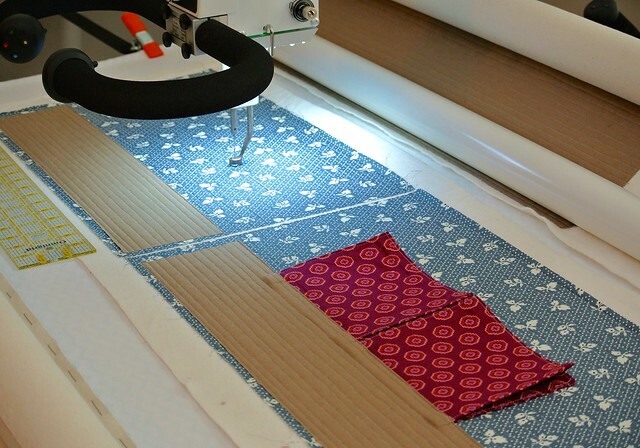 Just take your time, double-check the directions – and make sure you are not cutting out your fabric to the final dimensions before you quilt it. 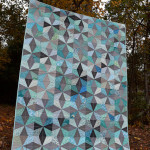 Cut a little big, quilt, and then cut down to size. It’s a little safer! 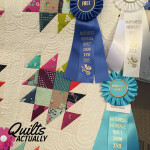 I made a few changes to the pattern… First, I quilted it on my longarm. I just did straight line quilting because I had intended to make another one, and wanted to test my construction methods before getting fancy. I also never added the snaps to the outside pockets. They are really more decorative than useful, so why bother? I added a zipper pocket to the inside, and a water bottle spot. 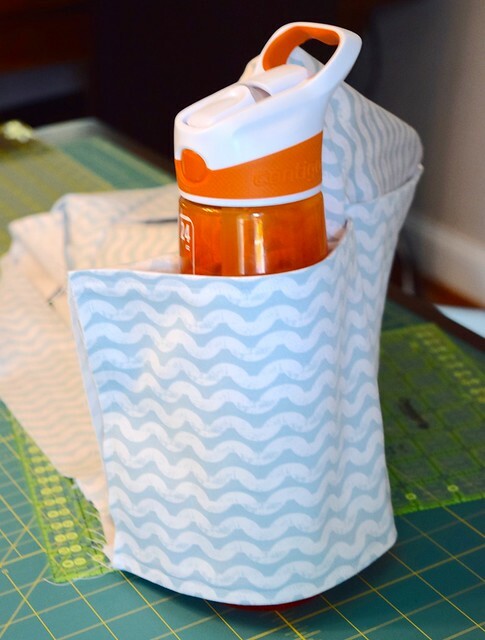 I’m not a fan of how my water bottle spot works, but the zipper pocket turned out great! 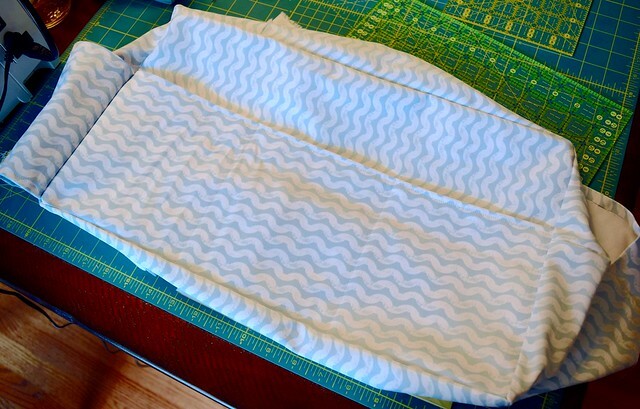 Tutorial for zipper pocket inside: Sew Mama Sew and UHandbag. I also added a row of straight pockets. Since using this for awhile, I’ve discovered this bag is not what I wanted for an overnight bag for me. It’s a little too small, and the handles are shorter than I like to carry. The pockets would have been great for this use, if it was how I used it. It’s not a lost cause though! It’s perfect to put my daughter’s clothes in for trips. I can fit a week or more of her clothes in here, and fold it up and tuck it away if we unpack somewhere (like we did in the camper this summer). We lived out of our bags for a month, and only did laundry once, so it was about 2 weeks of a 2 year old’s clothes in here. Fabric used: Linen for the base of the bag, and Chicopee for the handles. I think the blue leaf fabric may have been from the Denise Schmidt line for JoAnn’s, but I bought it so long ago I can’t remember for sure. The lining is Ty Pennington Impressions. Very nice!! I love the fabric you used! Your bag is wonderful. Any little girl would be in heaven to be able to use it. What a great-looking bag! Sure to get a lot of use. Nice work! 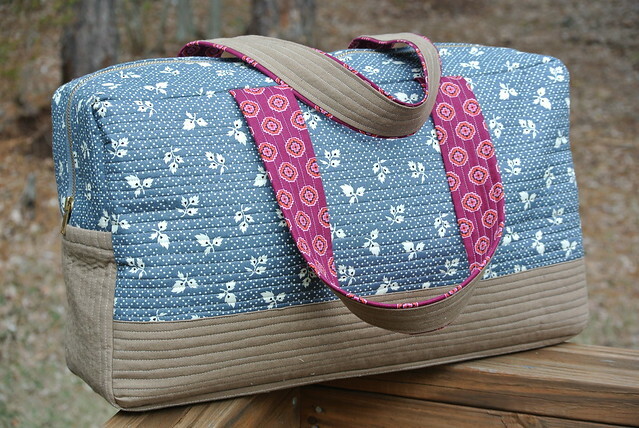 I love your fabric choice on this, the bag is beautiful! Hey! This is fantastic! I may have to make one for us, too. What is it about the water bottle spot that you don’t like? 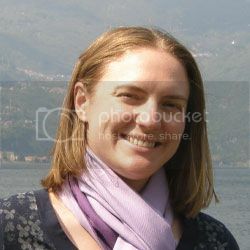 Thanks so much for linking all the tutorials. I love how you just ran with this and customized it to fit your life. It looks wonderful and is functional so that’s the great thing! 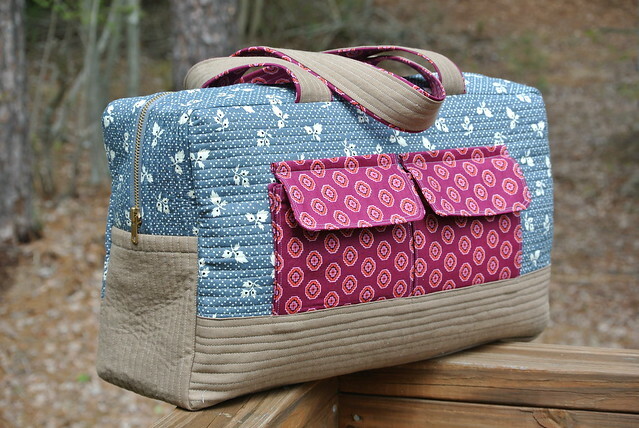 Beautiful bag; looks sturdy to take travel bumps and dings yet so functional. I need to make several bags for all ages. Thank you for the free pattern. I will try to make this bag as a gift.